MOVEHOME ESTATE AGENTS... are honoured to offer an outstanding 3 bedroom semi-detached property spanning approx. 120 sq mtrs to the open market. This property is simply an expansive light filled dream home that would be ideal for the professional family wishing to find a wonderful property located in the heart of Finglas, with every amenity on your doorstep. 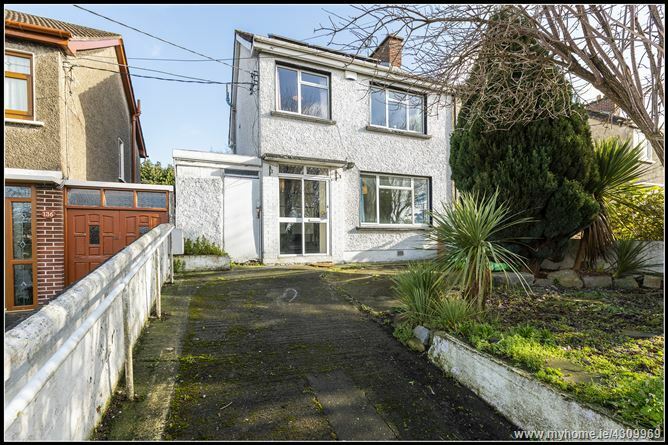 The much anticipated release of this property to the market represents a rare and genuine opportunity to purchase a spacious family home set in a well-established Dublin location that is in need of a little modernisation throughout. The accommodation consists of a large entrance hall that leads you to a separate living room to the front with a prominent fireplace. A single door leads into the rear living/dining area that is large with an opening to an extended kitchen area overlooking a large rear garden with a bright easterly orientation that floods your kitchen/living area with light throughout the day. The added utility area creates additional storage space with the bonus of an additional downstairs wc and shower room. The first floor hosts three very spacious bedrooms, two double bedrooms and a large single room to the front. Each bedroom is generous in size and the main bedroom to the rear enjoys fitted wardrobes. Completing the first floor accommodation is a main family bathroom. The layout and design of the entire property emphasises the light and space which all rooms enjoy along with generous proportions throughout. Located on North Road and within walking distance from the many services and amenities Finglas Village has to offer. Charlestown shopping centre, access to the M1/M50, Dublin Airport and The Port Tunnel are all within minutes drive, making this location ideal. 134 North Road is also within an excellent catchment area for both primary and secondary schools. The area is serviced by an excellent bus route, making this an extremely central address within 10 minutes commute of the City Centre.